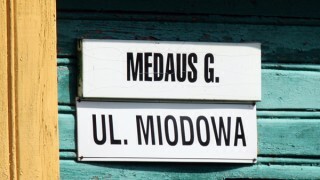 Lucyna Kotłowska, Administrative Director of the Vilnius Region Local Government, has appealed to the court for explanation clearly establishing, whom the court will oblige to remove bilingual plates with street names: is it going to be the administrative director of the local government or a bailiff. Lucyna Kotłowska has already been given fines by different courts for placing bilingual name plates within the Vilnius Region. Despite their being removed from some buildings owned by the local government, plates still have not disappeared from some private buildings. Lucyna Kotłowska, Administrative Director of the Vilnius Region Local Government has tried to explain that she is not entitled to enter private possessions thus she cannot remove any plates hung by the owner of a given place. Hence, she has appealed to court in order to clarify the way of conduct in case of plates placed within private territories. Vilnius Regional Administrative court examined Lucyna Kotłowska’s application. The decision is to be announced on 28th August 2014. Currently- according to the minister of the interior’s ordinance- plates with street names are placed on metal posts on the territory supervised by the Government.